Astronomers from the University of Amsterdam (the Netherlands) explain with a model how seven earth-sized planets could have been formed in the planetary system Trappist-1. The crux is on the line where ice changes in water. This is a very interesting model. It reminds me somewhat of how hail stones grow in thunderstorms here on Earth. In the case of hail, gravity is pulling ice pellets down while strong up-drafts blow the pellets repeatedly up into freezing temp regions of the cloud. In the case of young red dwarf stars, there might be considerable back and forth migration of the ice line due to all the flaring of the star. Presumably, such a process could be at work around any young star, no matter its mass, as all young stars are very active at first. I also wonder if other chemicals or elements besides H2O might play similar roles at their respective ice lines. Whether snow is more dry or more wet depends on the snow to liquid equivalent. When the temperature throughout the troposphere is well below freezing the snow is term a "dry snow". A dry snow has little to no liquid within the snowflakes. During a dry snow, snowflakes tend to be smaller. Also, when trying to make a snowball, it falls apart for the most part. In a situation in which part of the troposphere is very near or just above freezing, the snowflake will partially melt. This produces a liquid film on the snowflake. This makes it much easier for snowflakes to stick together. 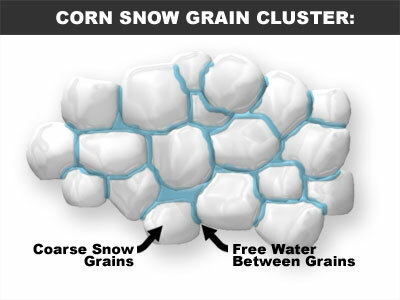 Thus, it is liquid water that is the "glue" to producing large snowflakes and snow that is easy to make snowballs with. While a dry heavy snow tends to have a huge amount of small snowflakes, a heavy wet snow tends to have a smaller number of snowflakes but the individual snowflakes are large. Of course, this begs the question how planets formed on the cold side of the snow line. Did their building blocks smash together with such force that they partially melted, thereby helping them to stick together? But how did those big building blocks, big enough to smash together with sufficient force to partly melt each other, form in the first place? Lingam and his co-author, Harvard professor Avi Loeb, found that planets in the TRAPPIST-1 system would be barraged by UV radiation with an intensity far greater than experienced by Earth. ... Lingam and Loeb estimate that the chance of complex life existing on any of the three TRAPPIST-1 planets in the habitable zone is less than 1% of that for life existing on Earth. And, as TRAPPIST-1 goes, so went/goes/will go billions of other Red Dwarf systems. BDanielMayfield wrote: And, as TRAPPIST-1 goes, so went/goes/will go billions of other Red Dwarf systems. Astronomers have narrowed in on a more precise estimate of the TRAPPIST-1 system. It will be great if life did survive all the Young age of the star. And with the older age of trappist one, may be now life is abondant. Interesting article Doum. Don't know about your wishful thinking though. On the one hand, older stars put out less flares than when they were young. But otoh, they still flare often enough to be a problem for the retention of atmospheres and oceans. That's a lot of blasting to take from close range over the billions of years. Astronomers reevaluated the TRAPPIST-1's age after measuring the speed at which the system is traveling through the Milky Way. Older stars are faster. They also studied the star's atmosphere as well as the frequency of its flares. All three factors suggest the system is significantly older than our solar system. "Older stars are faster." Imagine that. I wish I was faster ... oh well. Must be a conservation of momentum thing. "Older stars are faster." Imagine that. I wish I was faster ... oh well. Must be a conservation of momentum thing. BDanielMayfield wrote: Interesting article Doum. Don't know about your wishful thinking though. On the one hand, older stars put out less flares than when they were young. But otoh, they still flare often enough to be a problem for the retention of atmospheres and oceans. That's a lot of blasting to take from close range over the billions of years. The wishfull thinking have many IF. P.S. i still havent retry to make the collision of a 5 mass blackhole with the sun with the universe sandbox. i will try someday. But they are using term that i dont know. So i cant put a number in there if i dunno what it mean. How weird. Why would older stars be faster? The only logical answer that I can think of - insert Spock ears here - is that the the shape of the orbits of older stars have changed over the years, due to, well, due to whatever. But if their orbits have changed, they may be comparatively different from the orbit of the Sun. If so, their relative speed (the speed of the Sun along its orbit minus the speed of the other star along its orbit) might be higher than the relative speed of young stars, whose orbits have not had time to change much and may be relatively similar to the Sun's. Orbit of Arcturus vs. orbit of the Sun. Credit: ESO. Arcturus has a high proper motion, two arcseconds a year, greater than any first magnitude star other than α Centauri. It is moving rapidly (122 km/s) relative to the Solar System, and is now almost at its closest point to the Sun. Closest approach will happen in about 4,000 years, when the star will be a few hundredths of a light-year closer to Earth than it is today. Arcturus is thought to be an old disk star, and appears to be moving with a group of 52 other such stars, known as the Arcturus stream. <<In astronomy, the Arcturus moving group or Arcturus stream is a moving group or stellar stream which includes the nearby bright star Arcturus. It comprises many stars which share similar proper motion and so appear to be physically associated. This group of stars is not in the plane of the Milky Way galaxy and has been proposed as a remnant of an ancient dwarf satellite galaxy, long since disrupted and assimilated into the Milky Way. It consists of old stars deficient in heavy elements. However, Bensby and colleagues in analysing chemical composition of F and G dwarf stars in the solar neighbourhood found there was no difference in chemical makeup of stars from the stream, suggesting an intragalactic rather than extragalactic origin. Research from the Radial Velocity Experiment at the Australian Astronomical Observatory headed by Quentin Parker was first to quantify the nature of the group, though astronomers had known of its existence for some time. It was first discovered in 1971. Carnegie: Could TRAPPIST-1's Earth-size Planets Have Gas Giant Siblings? Could TRAPPIST-1's Seven Earth-size Planets Have Gas Giant Siblings? New work from a team of Carnegie scientists (and one Carnegie alumnus) asked whether any gas giant planets could potentially orbit TRAPPIST-1 at distances greater than that of the star’s seven known planets. If gas giant planets are found in this system’s outer edges, it could help scientists understand how our own Solar System’s gas giants like Jupiter and Saturn formed. 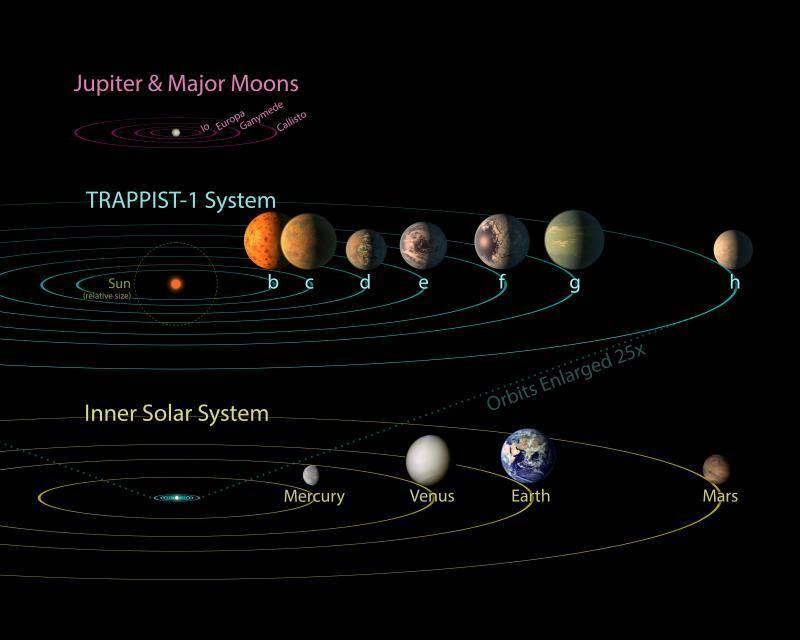 Earlier this year, NASA’s Spitzer Space Telescope thrilled the world as it revealed that TRAPPIST-1, an ultra-cool dwarf star in the Aquarius constellation, was the first-known system of seven Earth-sized planets orbiting a single star. 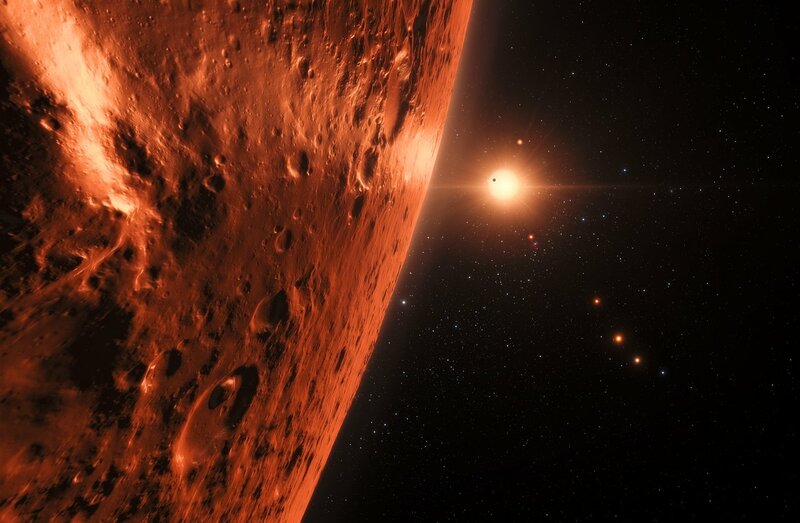 Three of these planets are in the so-called habitable zone—the distance from the central star at which liquid water is most likely to be found. Two exoplanets in the TRAPPIST-1 system have been identified as most likely to be habitable, a paper by PSI Senior Scientist Amy Barr says. A new study, using data from NASA's Spitzer and Kepler space telescopes, offers the best-yet picture of what these planets are made of. They used the telescope observations to calculate the densities more precisely than ever, then used those numbers in complex simulations. Researchers determined that all of the planets are mostly made of rock. Additionally, some have up to 5 percent of their mass in water, which is 250 times more than the oceans on Earth. So, water world might be plausible untill proven otherwise. Interesting possibility. Can a philosopher have an happy life just thinking? (no access to fire and metal and ....) what would be the thought overthere? The TRAPPIST-1 planets are curiously light. From their measured mass and volume, all of this system’s planets are less dense than rock. On many other, similarly low-density worlds, it is thought that this less-dense component consists of atmospheric gases.